LG's G-Slate tablet to come with 3D screen and latest Android software | What Hi-Fi? 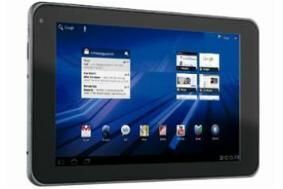 Android, the Google-owned operating software, is seen as the rival software to Apple's OS on both the mobile and tablet platforms, and will power this new generation of tablets set to take on Apple's iPad (and iPad 2). Details are thin on the ground for the G-Slate, which is due to be announced in full at Mobile World Congress in Barcelona later this month, but it does look like being the first tablet with a 3D screen. Our friends at Stuff magazine report that there are two cameras on the back for shooting 1080p 3D footage, viewable on the screen or on an external 3D display via HDMI. Whether 3D glasses will be required seems up for debate. The LG G-Slate has an 8.9in screen and is rumoured to launch in the US around March, with hopefully a UK release date to follow soon after.